Soup is one of the best comfort foods. Whatever taste you like the most, you can always find a great soup to match it. 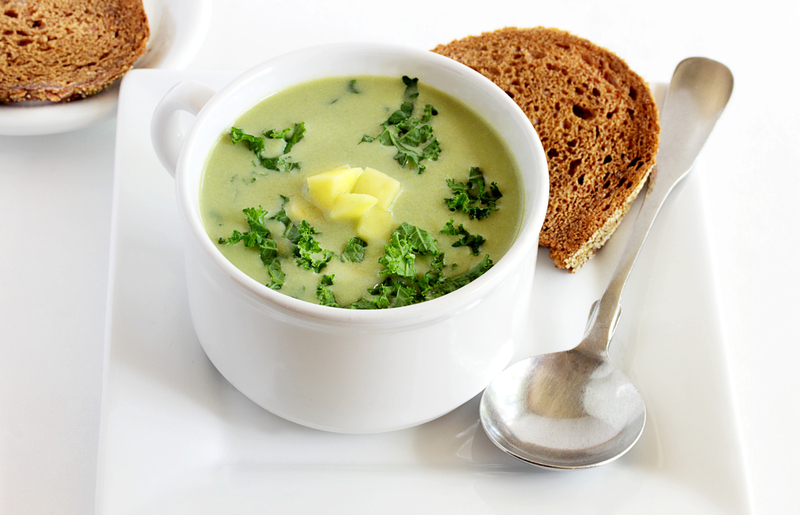 Our kale and potato soup recipe will warm you up and fill you up. Our potato soup recipe is different because we added poached eggs. The eggs add a unique but delicious flavor to the soup while also giving you an extra bit of protein. If you’re ready to make homemade kale and potato soup for your family, check out our recipe below! Combine the potatoes, garlic, salt, black pepper, basil, paprika, oregano, thyme, rosemary, and vegetable stock in a large saucepan. Heat it over medium-high heat and bring it to a boil. After it comes to a boil, reduce the heat and let it simmer for about three to five minutes. While the potatoes are softening, chop the kale. Look for any large stems and cut them into small pieces first. Add the stems to the potatoes and let it simmer for two minutes. Chop the remaining kale into narrow, ribbon-like pieces. Add the remaining kale to the saucepan. If you need to, add more vegetable stock. The kale should be covered entirely. Cover the pan and let it simmer for about 10 minutes. While the pot is simmering, poach the eggs. In a separate saucepan, fill it up about halfway with water and bring it to a simmer. Crack the eggs into individual dishes, then slide each one into the hot water. Cook the eggs for about two minutes, then remove the saucepan from the heat and let the eggs continue to cook for eight to 10 minutes. When the eggs are done, remove them from the pan with a slotted spoon and set them aside. By this point, the potatoes should be cooked. The potatoes will be done when you can easily poke a fork into them. The kale is done when it is tender. When the potatoes and kale are done, stir in the lemon juice or apple cider vinegar. Taste the broth and add more salt and black pepper if desired. If you want there to be more broth, you can also add more vegetable stock at this time. Divide the soup among four bowls and top each one with a poached egg. Sprinkle parmesan cheese on top or drizzle on olive oil if you’d like. Using Sauder Eggs will turn this potato soup with eggs recipe from good to great! Make sure you use our store locator to find the nearest grocery store near you.